When it comes to the business of buying and selling landmark properties, no one does it better than Harvey Kalles Real Estate Ltd. Total dedication to service, professionalism and confidentiality are the trademarks of results-driven sales representatives at Harvey Kalles Real Estate Ltd.
Their local market expertise combined with the company’s exclusive affiliation with Luxury Real Estate and unmatched international connections give them the ability to bring sellers and buyers of luxury real estate together throughout the world. Selling your home is a business decision. If you are thinking of buying, selling or establishing the value of your home, call Rhonda and Perry for a free confidential consultation. Magnificent & Private. This spectacular 2+ acres property with its impeccably manicured lawns is situated in the prestigious, executive Aurora community of Hunter’s Glen. Views of the lush woodlands are abundant from the gated entrance, the 5200 sf, 2-storey home with triple garage, 18x36 ft “indoor” pool with multiple walkouts and the elevated cedar gazebo. Magnificent 3500+ sq. ft. bungalow on an outstanding 2.3 acre wooded lot! Awe-inspiring design with only the finest materials throughout. Cathedral & coffered ceilings with heights of 9, 12, & 15 ft. Floors of Brazilian cherrywood, Italian crema marfil marble tiles. French country estate. 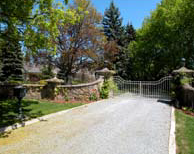 Totally private & set on an acre+ of magnificently groomed grounds with limestone, ivy-covered gated walls, spa with waterfall & reflecting pool, stone pool house with fireplace, day or night use of tennis court & putting green, coachhouse with loft or studio potential and a 7 vehicle garage. The “Tara Deux” Estate! 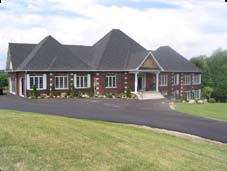 A paved drive winds by the pond to an irreplaceable 5500 sf finely finished home. From the over sized rooms to the luxury pool, patio and on to the gardens and the coachhouse, this property will amaze you. 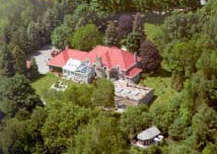 A 10 acre luxury estate only minutes to the city.